Customers will always consider convenience in a purchase decision (especially with gas at $4 per gallon). Every chain store operator must trade-off the cost of opening a store with the increased convenience for the customer which leads to more sales. In the traditional view of cannibalization, a point of diminishing returns is reached when the sales increase is offset by lost sales at a nearby store. With the overall decline in consumer spending, many retail stores and restaurants have closed. Some of these units probably should not have been built in the first place because they simply increased convenience for the customer without creating a sustainable level of net sales. As a result, many analysts have used “reverse cannibalization” estimates to determine which stores to close (how many sales dollars will be retained by stores nearby a closed store). Hopefully we are getting near the end of this painful process! Returning to the idea of “web-influenced” store sales, if the trip to the store is preceded by research on the web, convenience may not be the deciding factor. If the goods or services (or dining experience) have been carefully evaluated before getting in the car, spending a little more time or money on travel may be worth it to get the right product or service at the right price. If your friends are raving on Facebook and Twitter about a place that’s a little further away, you are no longer a slave to convenience. Your store location strategy and resource allocation plan might look a little different now. Rather than spend $1 million to open a store in the hot new shopping center, maybe you could spend $500,000 on direct marketing and brand-building on the web to increase sales online and “web-influenced” sales in the existing stores in the market? This type of strategic thinking suggests that an integrated approach to brand development and sales growth will make chains feel less of a need to build stores too close to each other. It may be that if you are worrying about cannibalization you shouldn’t even consider the deal! Of course there will be exceptions. I’ve seen many chains who have very successful stores across the street from each other because they appeal to different shoppers (e.g. in a regional mall across the street from an open-air specialty center). A restaurant might be in the food court of a mall with a limited menu and have a full service restaurant down the street. 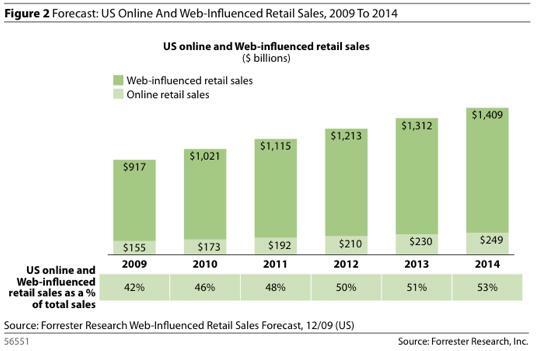 However, the battle for mind share and brand awareness is now being fought in cyberspace as much as retail space. One of the interesting by-products of this “omni-channel” approach is that the real estate and marketing departments will need to work much more closely together. There is some evidence of this happening over the past few years, but there is still a “Chinese Wall” between these groups that is hard to knock down. The executive level rivalries, different cultures and analytical methods, and the never-ending budget battles keep the wall in place. It takes strong vision and leadership at the CEO level to get these groups to cooperate and help the company find a way to win in the new economy. This entry was posted in Decision Making, Modeling and tagged cannibalization, chain store, multichannel, omni channel, retail impact, sales transfer, social media by Jim Stone. Bookmark the permalink.